'Vajrapradama' means "unshakable trust and confidence". This mudras directs breath, awareness and energy into the chest cultivating a sense of openness and trust in ourselves and life. When we open to trust, we are able to more easily navigate the challenges of heartbreak. We are able to trust in our own inner strength and ability to embrace life fully. Our open hearts allow us to experience a deepened state of joy and vitality. 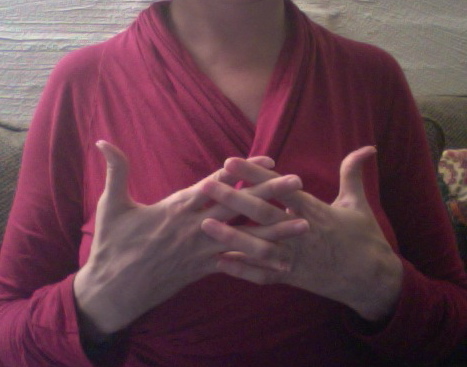 Palms of the hand are facing the chest. Open the fingers and interlace the middle digits, with the left little finger on the bottom while extending the thumbs upward. There is a little bit of space in the fingers webbing. Relax the shoulders back and down, with the elbows slightly away front of the body and the spine aligned.